ChemOffice Professional 17 is now available to download for members of the university. ChemOffice Professional 17 is now available on managed Windows workstations through WPKG. If you use a Windows machine managed by the department, you should use WPKG to install the software. To install ChemOffice, download the installer following the instructions in the Downloading Software section below and note where you have saved it to. Locate and run the installer, following the on screen instructions. Once you have finished the installation, you will need to enter the ActivationCode you obtained by following the instructions in the ActivationCode section below. You are NOT allowed to distribute these details to anyone else, ever. Once you have done this, you should be able to start ChemOffice. If you registered on the Perkin Elmer site before 2018 you will need to create a new account on Perkin Elmer's Flexnet page at https://gallery.cambridgesoft.com/register.html?FlexeraAccountId=5439SL in order to obtain the latest download. If you encounter difficulty doing this please email support@ch.cam.ac.uk with your Name, CRSid and Department. To get the activation code log into Perkin Elmer's Flexnet page at https://gallery.cambridgesoft.com/register.html?FlexeraAccountId=5439SL . Go to Order History on the left of the page. Under there you should see a list of versions we have purchased. Click on the version you want to find your activation code. Do not share this code with anyone else. 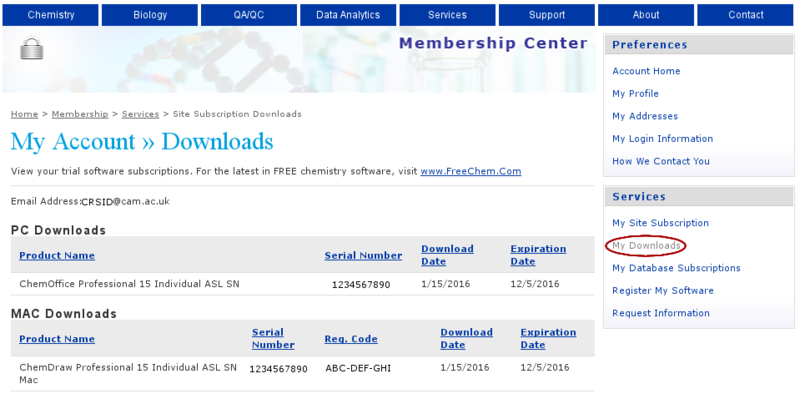 When you have downloaded the software, for older versions, you should be able to obtain your serial numbers by going to the PerkinElmer/Cambridgesoft site and looking under the Downloads section. When you download the software PerkinElmer do NOT send the serial numbers by email. You are NOT allowed to redistribute these files under any circumstances, ever. Download the installer following the instructions in the Downloading Software section above and note where you have saved it to. Locate and double click on the installer. You should see the following screen. Drag the ChemOffice icon to the Applications folder. 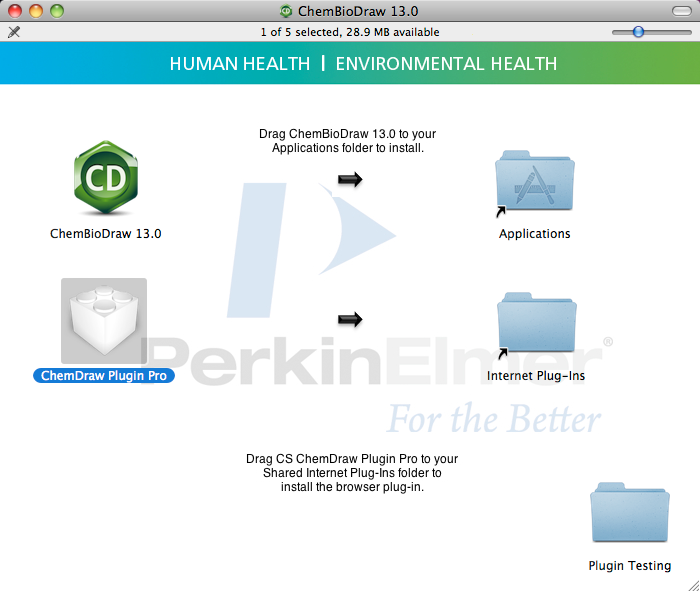 Optionally drag the ChemDraw Plugin Pro icon to your Internet Plugins folder. This can be found inside your ~/Library folder. On MacOS 10.7 and above the ~/Library Folder is hidden by default. You can access it by using the Go menu in Finder while holding down the Alt key. This article has more details. Note the registration code and serial number from following the instructions in the Serial Numbers section above. You are NOT allowed to distribute these details to anyone else, ever. Next the registration window will appear. Enter the serial number and registration code from the previous step.